I think that most dog owners will agree with me here. The worst thing in the world to see if your dog suffering. It makes you feel terrible when you know that your dog is hurting, or uncomfortable. Unfortunately, dog allergies can be very debilitating. While only your vet can diagnose whether or not your dog is actually experiencing an allergic reaction or not (and what, specifically, your dog is allergic to), there are some things that you can to help your dog feel better and possibly alleviate some of the symptoms. If your dog is suffering from allergies that cause him to scratch a lot, one thing you can do to help relieve the itching is to apply an herbal topical to your dog’s skin. Specific herbs that are good for this include: peppermint, chamomile, rose bark, juniper and lavender. #2. 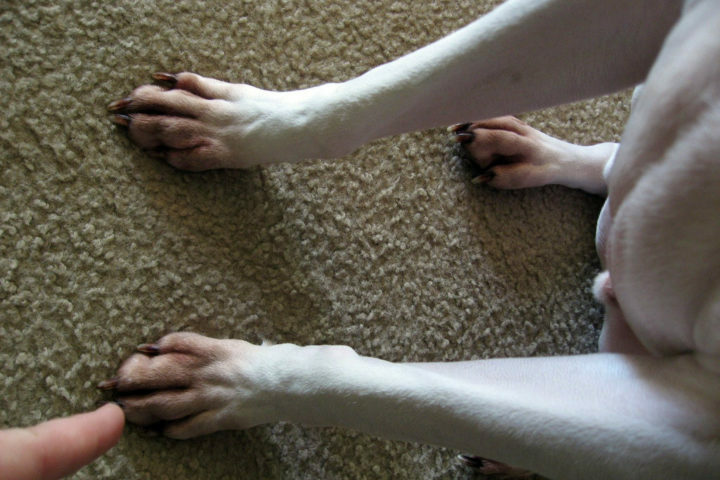 Clean your dog’s ears with white vinegar. If your dog gets ear infections due to allergies, try putting a tiny amount of white vinegar inside your dog’s ear. Only do this if you notice that your dog has a lot of brown-pink ear wax, is shaking his head a lot, scratching & rubbing his ears, and has a nasty smell coming from them. Those are classic signs of an ear yeast infection due to allergies. #3. Try apple cider vinegar. If the skin has become so itchy that your dog has scratched or licked his paws so much that a hot spot has resulted, then pour apple cider vinegar into a clean spray bottle and spray some directly onto the spot. This will dry up the area within 24 hours and keep you from having to shave the area in order to treat it. #4. Change your dog’s diet to a natural one. If your dog is vomiting, has diarrhea, loss of appetite, and seems lethargic, then he may be suffering from dog food allergies. However, those symptoms can also signal something much more serious going on, so you’ve got about 48 hours to try a home remedy yourself. If the symptoms don’t go away by then, you must take your dog to the vet. The truth is, many commercial dog foods have additives and preservatives that some dogs are allergic to. (Just as some people have allergies to additives and preservatives in human foods.) One way you can try to determine if your dog has a food allergy is to stop feeding him the dog food that you’ve been feeding him. Instead, prepare food for your dog using only natural ingredients. If you notice a change in your dog then he is probably allergic to one of the additives or preservatives that were in his dog food. Either buy dog food that does not have those ingredients, or continue to prepare your dog’s food from now on. #5. Bathe your dog regularly. One of the easiest natural cures for dog allergies is to bathe your dog on a regular basis. (About every 10 days or so is good.) The reasoning behind this is that your dog may be picking up allergens which are getting trapped in his coat and on his skin. By bathing your dog on a regular basis, you can help to remove those allergens and relieve the symptoms associated with your dog’s allergies. Those are some natural treatments you can try in order to help alleviate your dog’s allergy symptoms. My friend’s vet also recommends adding olive oil to your dog’s food. Keep in mind, if your dog has severe symptoms — such as a skin infection, pustules in the ear, or blood in the urine or stool — you need to get your dog to a vet ASAP. Natural cures are great if you catch the problem early, but don’t mess around with symptoms that can lead to serious health issues. Your dog will thank you for it!